Angelique arrives at Quentin’s execution with the head of Judah Zachery, identifying it as coming from the home of Charles Dawson. Desmond uses the distraction to shoot Gerard, and he is finally released from Judah’s hold. When the head of the warlock dissolves into a skull, Angelique’s story has new resonance. She is held for questioning and Barnabas returns home to see his own son, Bramwell, attempt to win Catherine back in the Parallel Time room. Barnabas determines to express his feelings to Angelique. When he approaches her to do so, Trask bursts in and fires a pistol at her. 1197 is rife with some of the most profound moments in the series… some that are really there… some that play out in my mind’s eye based on implications and wishes. In classic, Dark Shadows tradition, it’s also bang-up entertainment. And it’s the start of goodbye. I can’t ignore that when I watch it. The idea makes my chest tighten, and the execution has a strange, terminal excitement that exists in no other installment. It’s a resolution without a price -- until the very, very final seconds. Before that? It begins with a sequence so satisfying that I want to take up smoking just so I can have a cigarette afterwards. Appropriate salute for a show of the era. It’s still hard to imagine that this is the penultimate installment in the whole thing. But it is. Keep that in mind. 1841PT is underrated, and it’s also an epilogue, existing outside the continuity we care about. Most viewers will be lost without thinking abstractly… or approaching it first, as the only Dark Shadows they know. But this… episode 1197? This is the real beginning of the end. It’s the series saying goodbye. It’s how nearly 1225 episodes of continuity depart without knowing it. And what was it like for viewers at the time? For the more aware, every day was alpha and omega. With no seasons and no full bundles dropping on Netflix at once, each episode was the next, and the last, and a cliffhanger for more, and the final chance any of this might ever, ever, in any form, be seen. Dark Shadows is a ruthless-yet-delicate show. For one with such a male-heavy cast, it is often effete. But not here. Not now. There are too many feelings at stake for the show to be obsessed with preserving them under glass. It may be a saga that begins with Louis Edmonds passive-aggressively sneering at Joan Bennett, but it ends with David Selby swaggering off the blindfold on an execution block. He’s got a backbone like the Rock of Gibraltar, but a Victorian scientist to the end, it’s never at the expense of his precision and dignity. Ending the show on a flashback gives us a sense progress and a point of departure against which we can measure the very first episode. On no other show can we reflect on how far we’ve come and how far we’ve strayed, all at once. The bravado of Desmond and Quentin -- and even poor, sad Gerard -- make wonderful counterpoints for Barnabas. Especially true as the great man commits to the most dangerous truth and choice of his life: true love. The pivot for him is the Parallel Time sequence. At this point, the PT sequences have become the Dark Shadows equivalents of lame musical guests on SNL -- time to hit the head, check text messages, and light some hookah coals. But in 1197, the interlude is a beautiful metaphor, screened for Barnabas by a godlike Dan Curtis to spur him to take the chance he must. Seeing your own son and twin from the present and future at once is an Escheresque mirror without equal. Then to watch him struggle to overcome the loss of the duplicate of the love you’ve denied yourself because, for one reason, she’s not adequately respectable? A woman denying you for someone even more respectable than yourself? That’ll get to a guy. For Barnabas, it’s a Marley’s Ghost moment. He’s completely transformed for the first of several times in just a few minutes. My favorite moment of potential energy is just after he’s seen off his shadow brother -- Quentin -- into his new and free future. 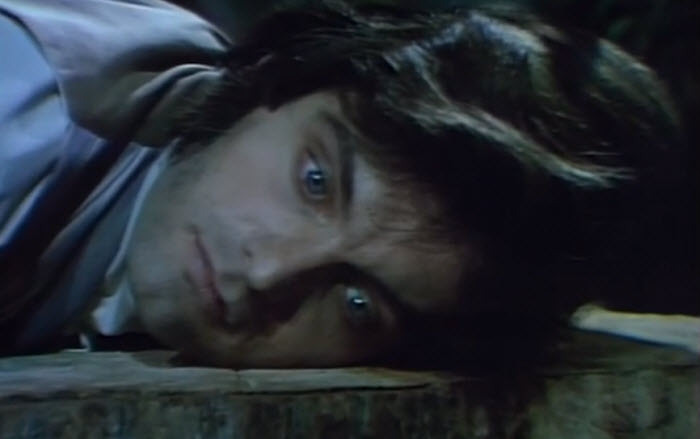 Alone in the foyer, having seen someone leave him and Collinwood smiling for once, Barnabas turns toward the drawing room, where he knows Angelique awaits him. And for just a fraction of a second, you know he catches a glimpse of his portrait. Is he imagining his first moments in the Collinwood of 1967? How can it not? The entire journey allusively flashes by in an instant. It’s a moment of everything, abridged. Like the end of Cyrano, it has a genuinely terrible ending, and I mean that in the best way. Lara Parker gives it a bit of a melodramatic twist to her depiction of having been shot. Anything realistic would have been too much to watch. We need the cushion of art in a moment so incredibly cruel. In episode 411, Barnabas discovers the nature of Angelique’s curse. He responds by executing her, and if that chain of moments forms the nadir of their relationship, 1197 is the summit. If we look at the 1795 flashback as the start of his story, then 411 and 1197 bookend his journey. In both episodes, only Barnabas survives. Is it a ritual? To what end? Why does death await Angelique at either end of this spectrum? Miserable survival for Barnabas. Of what possible benefit is this? Especially twice. None. Because he’s not supposed to benefit. We are. The audience. We benefit by watching where his choices lead him. In both instances, Barnabas’ central sin is dishonesty with himself. It’s easy to understand why he’s initially blind to his love in the year 1840; he’s seen Angelique torment the inhabitants of three separate centuries. It’s harder in 1795 because his denial is more complicated. Maybe it’s a matter of social class and family pressure. Maybe it’s timing. He certainly loves Josette, and she provides none of the challenges posed by Angelique. I don’t think it’s an issue of more nor less. For one thing, Josette isn’t here. Hasn’t been, by Barnabas’ internal clock, for about 175 years or so. I mean, not really. Her ghost has given him the permission to move on. And it’s clear that Roxanne seemed like a good idea at the time, but, you know, um, yeah. Swipe left. That leaves Angelique by default, but how can he look past her misdeeds? The only salient fact is that he does. Yes, it’s uncomfortable. Baffling. Yet, it’s strangely, horribly, wonderfully, inexplicably, infuriatingly, and unfairly right. That’s what makes it love. This episode was broadcast Jan. 26, 1971.